In this tutorial we are going to learn how to implement a multiple overlapping pad design. The procedure shown shows how we can design multiple pads without creating new triangle surfaces for each pad design. The procedure is as follows. Take the pads as designed by the architect or yourself and make sure they have design heights on the pad corners. Run the multiple pad design and define which sides have the pad template implemented. You do this for each pad in the job. 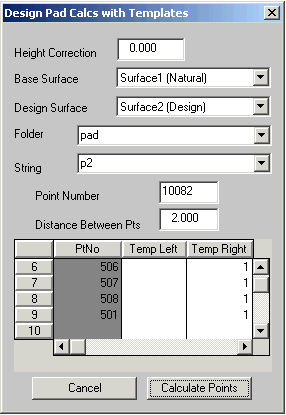 You then create a design surface showing the designed pad points. By inspection we will decide whether anything else is to be done. We will show how to clean up the model if there is anything needed to be done. Finally the design surface is merged with the base surface and a finished contour surface is created. Finally we do a volume calculation to present to our client. In this design we are working on the following. 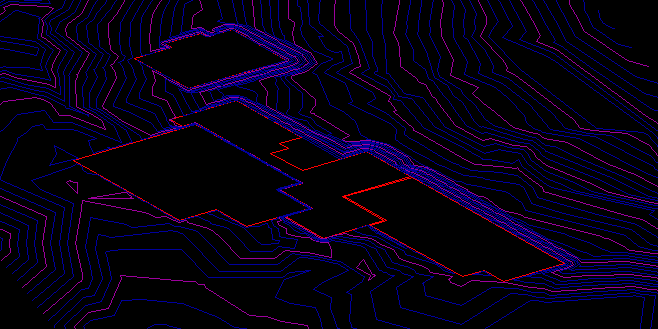 It is a rather large concrete pad design for a new house being built in the Australian bush. The pad design consists of 4 pads as follows with the heights defined. The first step is to set the pad points to have the appropriate design height upon them. Select the first pad string P1. Now under Point selection select the points by selected string. 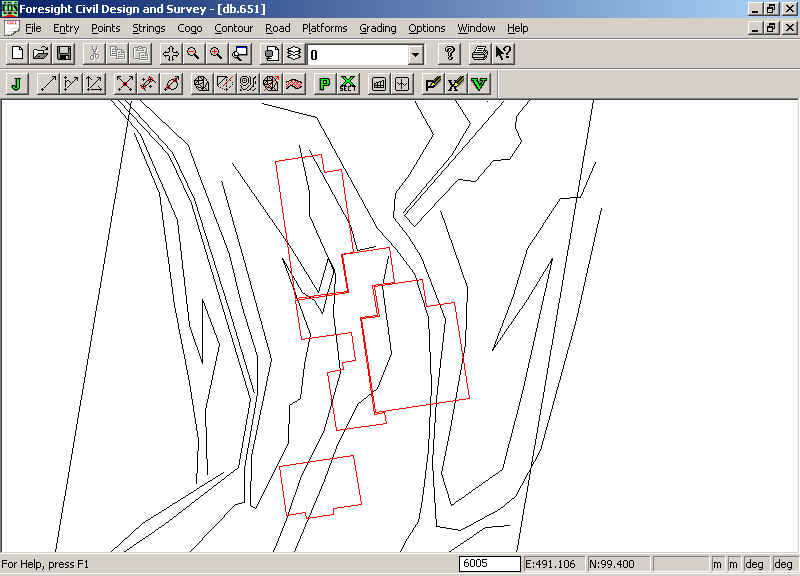 Now using point Alter we can set the design height to 15.30 and alter the points. I will leave you to alter the points for strings p2,p3 and p4. For a more complicated job such as this one it is best to sit down first and plan on which pad sides need to have templates hung off them. The plan being that for pads close together on one side we don't use a template here. Looking at the pad at the bottom of the page. This is a shed or garage for the car. As this is standing by itself we don't need to worry about pad intersection points running into other pads. So for this one we can use a template along each side of the pad. Under the "Platfom" menu select the "Design Platforms Multiple". Select the p2 string to be used by clicking on the string back in the view window. As you can see below the point numbers associated with this string are filled in; in the table at the bottom of the dialog. In this case we have decided to use templates right around the pad. Also the templates are on the right side of the pad as it has been defined in an anti-clockwise direction. 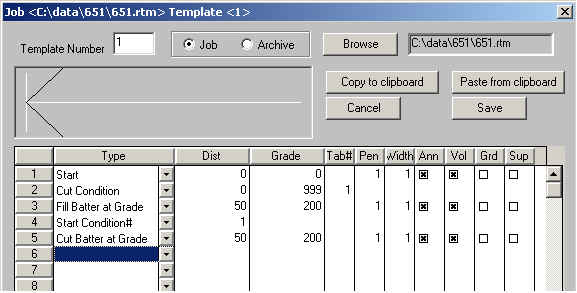 Simply fill in 1 for template 1 on the right side next to 502, 503 all the way down to 501. The first line can be left blank as it is not used. Set the start point number to a new range - in this case 10000 to make it easier to track any points created. The default pad distance of 10 is much to big in this case. Set it to 2. The dialog should be filled in as follows.Run the Calculate points and the points are designed and placed into the database. When the procedure is finished you are able to click on another pad in the view and repeat the process for this one. I would suggest at this stage to close this dialog down and check the points that have been added in. 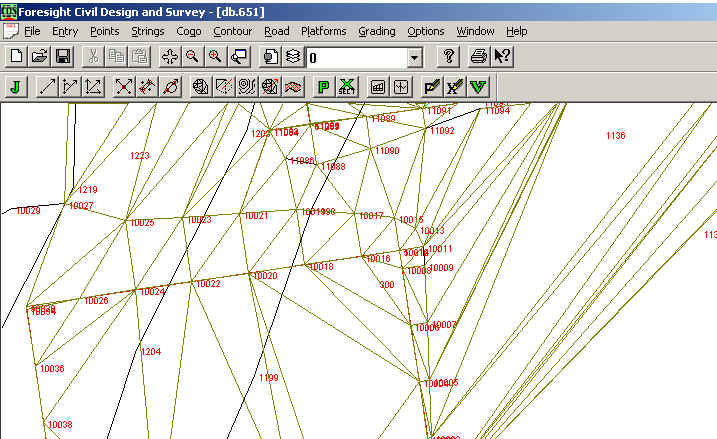 If all appears well bring up the Design Pad multiple dialog again and proceed. If you now went to pad p1 you will see the point numbers 401 to 408 and back to 401. If you look at the view; please note that you may zoom sections of the screen while the dialog is open, you will see that the edges (404-405),(405-406),(406-407),(407-408) have an edge near another pad. We don't wish to have templates in these areas. Thus put template 1 to the right of 402,403,404, and the final 401. The remainder is left blank. Set the initial point number to a new range of 11000 and also set the distance between points to 1 metre. Experience will dictate what is an acceptable value here. Look at the size of the pad etc. Run these points into the database. You are now ready to proceed to the next pad. Click on pad p3. The program will prompt you to accept this string and overwrite the table in the dialog. Say yes. Fill the table in. In this case put 1 to the right of 602,603,606,612 and 613. You may ask what about 607 to 611. If you inspect the drawing you will notice that this makes a skinny U shape. In practice the grader will simply take out everything within the U rather than putting in some batter's. Run this in and repeat for pad p2. Close down the dialog and triangulate this surface 2 design. You can now do a visual inspection checking in particular for triangles that cross the edges of the pads. If you look along the edge of pad p3 between 602 and 603 you will notice that half of this edge overlaps the bottom of pad p4. For this case you need to manually delete some of the points that are within pad p4. 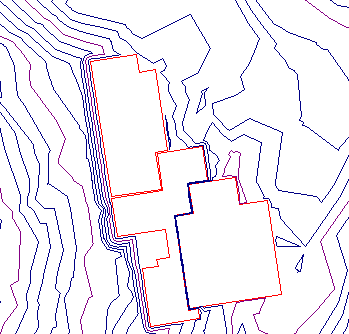 You can now contour the design and visually check the contours. Again no contours should cross the edge of any pads as they are all flat. The next thing is to delete some of the unneeded triangles that join some of the pads. You are now in a position to merge this design surface with the original base surface. Create a new contour surface from Contours then Surface Parameters menu. Make it a combined surface. From the contour menu select the merge surfaces option ; the base is surface 1; the overlay surface is 2 and the final result is in surface 3. As a final exercise a dwg file was created. 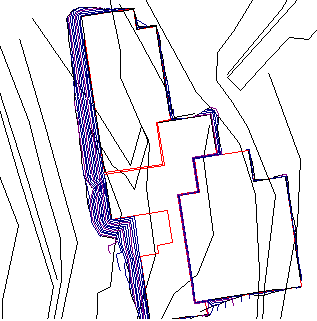 Under plot parameters we exported the pads as well as the combined contours an exported it to Intellicad standard. The result is seen below. You can see the pads cut into the hill to the right while the front of the new house to the left looks down the valley.